school. The site of the new school was chosen at the north end of town on land owned by Earl Pittman, of Lewistown and Leroy Davis of St. David. A total of 25 and a third acres was purchased. 25 from Mr. Pittman at a cost of $1500 an acre and $1,800 per acre, purchased from Mr. Davis. The bond issued was for $l,049,000.00, and to this figure was added the money from the sale of the old high school to the Grade School District, for a total of $151,000.00 to which was added a total of $70,000.00 from interest bearing bonds, with the total cost approximately $1,300,000.00 for the building and contents. Construction was started by the laying of the corner stone by Mr. Orville Janes President of the board of education, at that time. In 1960, an organization was formed at LCHS. It was the Spoon River Chapter of The National Honor Society. It was innaugerated May 10th, 1960, at the old High School, in an impressive candle light ceremony conducted by the officers and directors of the Canton Chapter. On the third Friday of March of 1961. the move was made to the new building, without interruption to classes. The Class of 1961, was the first class to attend the new high school, and graduated three months later, in May of 1961. 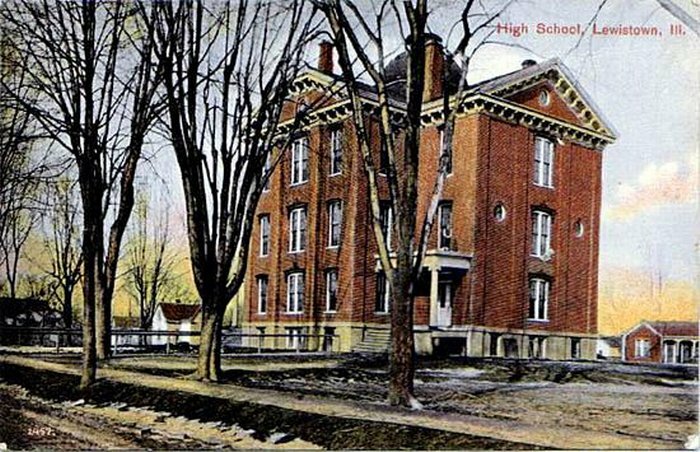 Being the first class to attend as Seniors, a large boulder or rock was placed at the entrance to the new school. It was to be an annual tradition. The Class of 1965 was the first class to attend all four years at the new building, and graduate from there as well. The old high school was demolished in June of 1980, making way for the new Spoon River Towers that stands in the location now. Prior to the building of the Towers, the old school was used for Central Grade School, until the new grade school was built near Avenue 'L''. For a short time the old High school served as the Tribal Center - a recreational facility for the townspeople. It was very short lived. It was then, that 'Poke' Kenzel of Canton was contracted to tear the old building down. In 1996, a special series of public meetings and hearings were held prior to placing a consolidation question on the ballot to consolidate School Districts 341 and 141, and as well Prichard Clark and St. David. The referendum passed in the Spring of 1996, and the consolidation took place in the fall of 1997. Lewistown Community Unit School District #97 was the result of the consolidation. Lewistown Central was remodeled to accommodate the new students.The McNally Elementary School proved to be getting too old for the students in the late 1990's. A new elementary addition was added on to Central School on Avenue "L". The new addition was open for the 2000-2001 school year and the old elementary was turned into New Horizons, an alternative school for students with special needs. From fall of 2001 - fall of 2004, the high school was slowly remodeled. New windows were installed in the classrooms and hallways. The old office area was completely torn out and a new office was built where the old offices stood. The school was fitted with central air-conditioning after having no air-conditioning for all of its years. The football and track field saw the addition of a new ticket booth entrance building. An overhang was put over the concession stand area. New bleachers were installed at the football field and a new concession stand/announcer tower was built at the baseball field. The inside halls of the school were also newly painted. As of the 2004 - 2005 school year, Lewistown High School is a school with strong curriculum, organizations, and sports. Lewistown High School looks towards the future and many years to come and go along the sands of time.